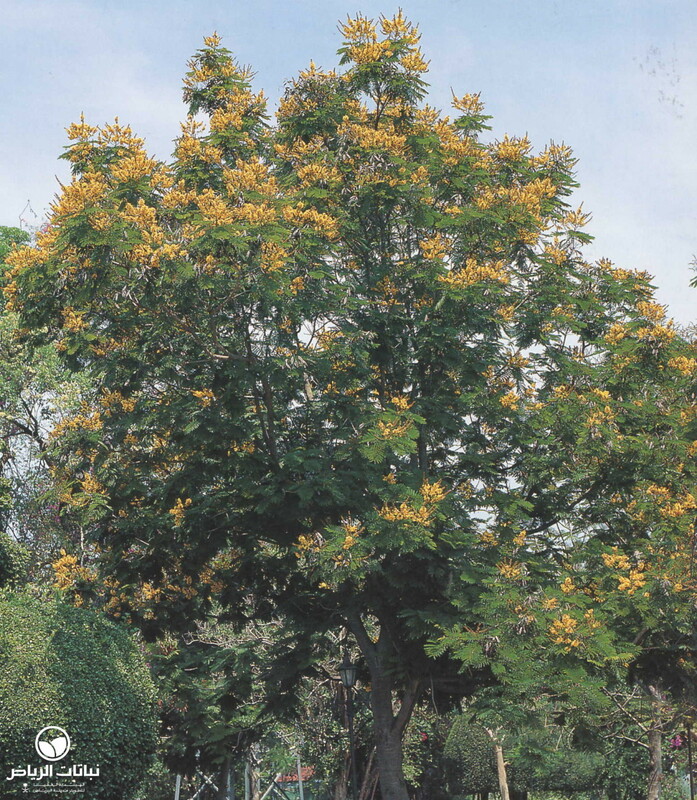 Bearing names such as Yellow Poinciana, Rusty Shieldbearer and Copper Pod, this is a showy, flowering tree, native to tropical Asia and Australia, and introduced to the Arabian peninsula. 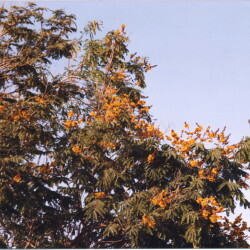 Not often seen in Arriyadh, where it may lose its leaves during a long dry period, the leaves reappearing quickly with the flowers. 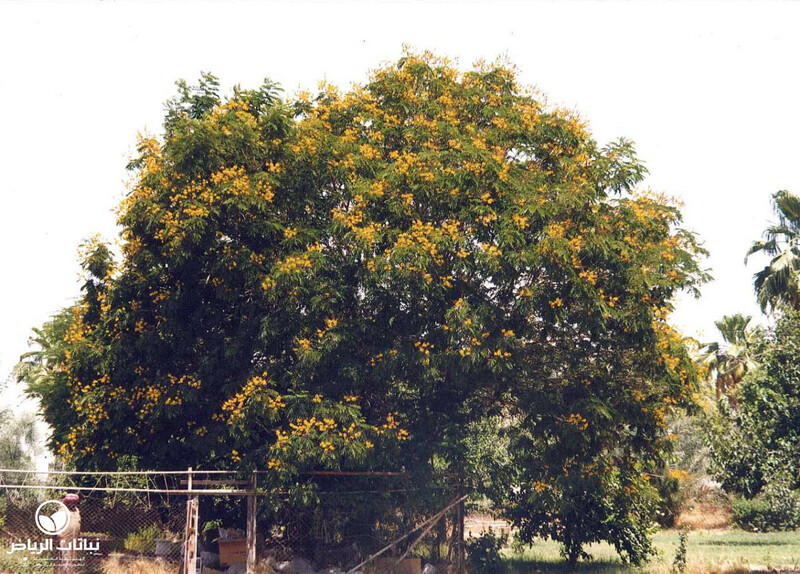 It grows rapidly to 20 metres high and 10 metres wide, and has an umbrella-like crown with fuzzy, rusty-red twigs. The rich green, bipinnate leaves are about 60 cm long with oval leaflets. 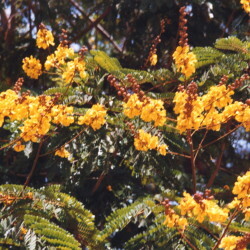 Bold, yellow, nocturnally fragrant flowers, with crinkled petals, each with a brown spot, are borne on spectacular, upright racemes about 45 cm long, blanketing the tops of trees. 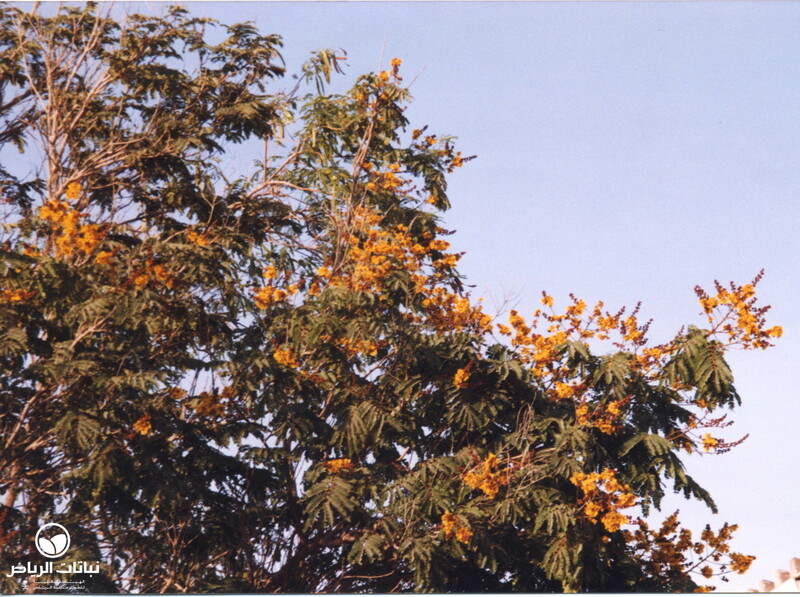 Large bunches of the copper-coloured fruit, containing flattened, oblong seeds, are attractive at first, but later look untidy because they remain on the tree for months. P. pterocarpum requires light shade to full sun, and cannot tolerate heavy frost. 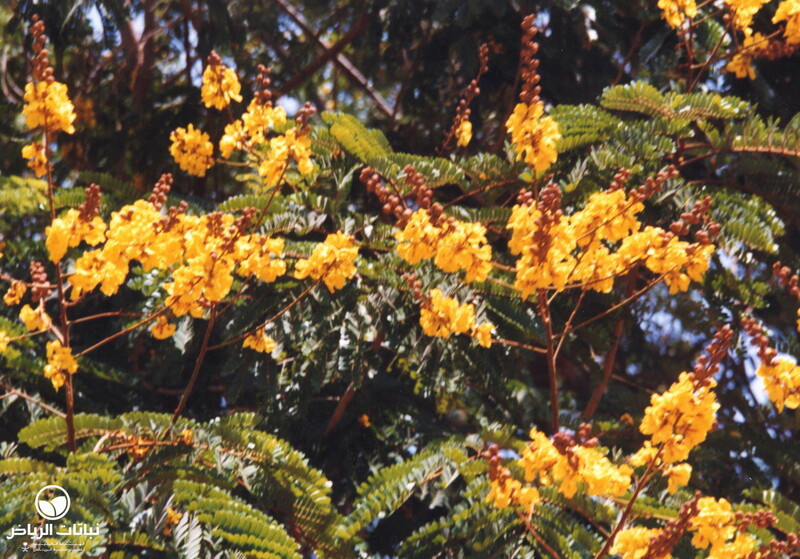 It is very salt-tolerant, preferring moist, well-drained, sandy soil. Being drought-resistant, irrigation requirements are moderate. Propagation is by seed, which needs to be scarified. 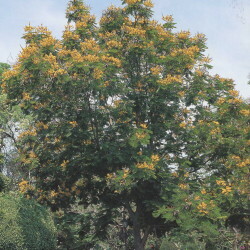 Yellow Poinciana is an excellent shade, street tree and a specimen tree, if plenty of space is available. 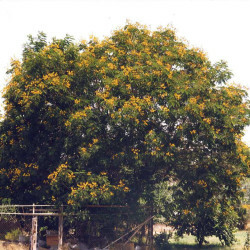 It needs regular pruning, when young, to keep the tree dense and in shape. Care should be taken not to plant it too close to structures and hard paving, since the trees have shallow root systems. Generally pest- and disease-free, this is a low-maintenance tree, which may create a leaf litter problem, if not kept neat.